THPBlog: Sierra Pacific Industries to clearcut log near Trinity Lake. Sierra Pacific Industries to clearcut log near Trinity Lake. 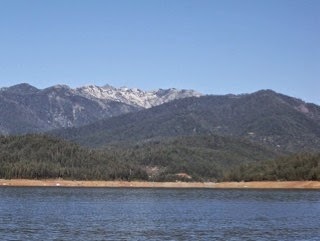 This THP is about 10 miles NE of Weaverville, CA along Trinity Lake and just east of Highway 3 at an elevation of 2,400 to 3,740 feet. Sierra Pacific Industries is planning a clearcut tractor based logging operation in Douglas fir, ponderosa pine, white fir, sugar pine and incense cedar forests. Unit 439 is adjacent to Alpine View Campground within section 13. Tractors are proposed for use on steep slopes over 65% grade on existing skid trails, and on slopes up to 60% grade within units designated for cable logging to construct fire lines. SPI also wants to reduce the buffer area within a class II (mid-sized) spring to 50 feet at a specific location in unit 438. There is a bald eagle nest .5 mi from the THP area in section 28, and a spotted owl nesting territory within 1.3 mi (TRI00300) which SPI is attempting to get invalidated so they can log out the habitat. More information is available on the THP Tracking Center website.